Who can use a performance bond template? Either a developer who wants security from a contractor on a construction project or a bank or other party that gives the performance bond. What is a performance bond for? A performance bond is a an undertaking to make a payment. It is given by a bank or insurance company to a developer who may make it a condition that the contractor obtains this security. Usually it is for 10% of the contract price. The developer can call for payment under the performance bond if the contractor becomes insolvent or defaults under the contract. You need this document if you are a developer wanting to protect your project against non-performance or insolvency by a contractor. What are the main issues for a performance bond? The main issue is whether the performance bond is “on demand” or “conditional.” In other words, can the developer call for payment under the bond if something goes wrong or does the developer have to prove the amount of their loss before a call can be made? 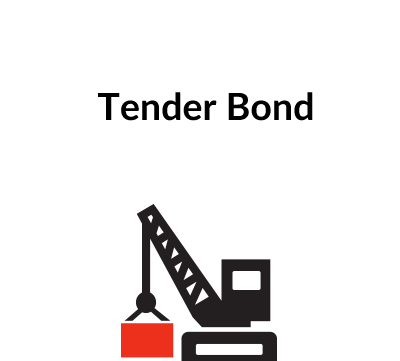 Our performance bond template is an ‘on demand’ bond, but with some documents being required before payment is made. See our Explanatory Notes below for more details. ContractStore supplies templates and is not a law firm. But all our templates are written by experienced lawyers, in this case by a specialist construction lawyer. So, we can arrange legal assistance for customers who need special terms in one of our documents or a bespoke template. . For more information see our Legal Services page. 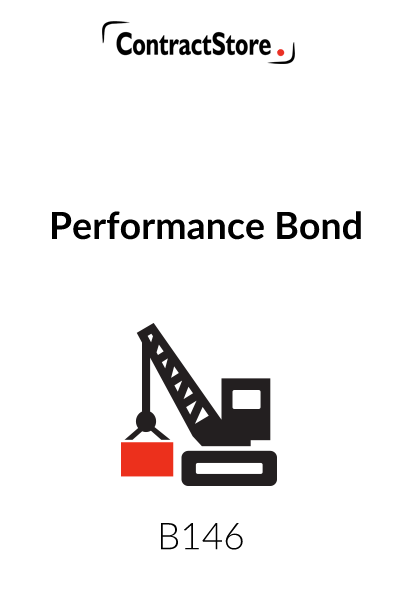 A Performance Bond is a form of security provided by a contractor to a client or developer and consists of an undertaking by a bank or insurance company to make a payment to the client in circumstances where the contractor has defaulted under the contract. There are two types of performance bond – “on demand” and “conditional”. On demand bonds are sometimes used in the UK construction industry, and they are a standard requirement in many international contracts, as well as in the petroleum and power industries within the UK. On demand bonds are usually provided by banks, and as the title suggests, the bank is required to make a payment under the bond whenever this is demanded. A conditional bond, by contrast, is common within the UK construction industry. Such a bond is usually issued by an insurance company, and payment is usually conditional upon the employer who makes the call proving the amount of loss which he has suffered. 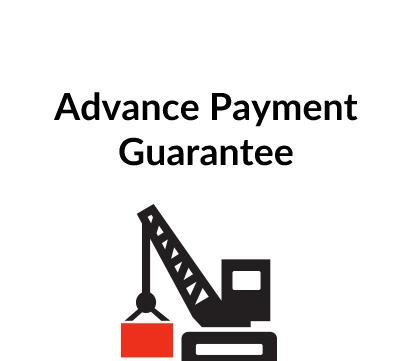 In practice, therefore, a conditional bond may require litigation before any payment can be obtained. Our performance bond is an on demand bond, but it does require certain conditions to be fulfilled before a call will be honoured. The client must accompany the demand with a statement which shows either that the contractor has failed to remedy some default under the contract or that the contractor’s employment has been terminated. This gives the contractor some comfort – a false statement would justify action against the client for making an unfair call. The value of a performance bond is usually expressed as a percentage of the contract price, usually between five and twenty per cent of the contract price, with ten per cent by far the most common figure. In our document the bond is addressed to the party with whom the contractor enters into the contract, referred to in our document as the Purchaser. The opening paragraph contains spaces for details of the name and address of the contractor and a brief description of the works comprised in the contract as well as the percentage value of the bond in relation to the contract price. The second paragraph contains the bondsman’s undertaking to make a payment on receipt of a demand by the Purchaser. This is, however, conditional upon the demand being accompanied by either the documents referred to in paragraph (a), or the statement referred to in paragraph (b). A third alternative – a statement that the Contractor is insolvent – might also be included, but in practice insolvency is likely to result in breach of contract or termination and so may already be covered under our wording. The wording allows the Purchaser to make more than one call under the bond, but the maximum amount that it can recover is specified and this will be equal to whatever percentage of the contract price applies. Every demand must be signed by a director of the Purchaser. Sometimes additional wording is incorporated which requires the signature to be authenticated by the Purchaser’s bank, thereby giving some more protection against an unfair call. The bond is stated to be irrevocable and payment must be made even if the contractor objects. It is worth mentioning here that the courts in England (and many other, but by no means all, countries) will very rarely prevent payment being made under an on demand bond. Fraud is just about the only ground for an injunction to prevent payment which the courts will accept. A paragraph has been included which makes it clear that even if there is a change in the terms of the contract or some arrangement made between the Purchaser and the Contractor, this does not in any way invalidate the bond. The penultimate paragraph states the validity period of the bond. Our wording contains two alternatives – a fixed date or the issue of the taking over certificate of the contract to which the bond relates, whichever is later. 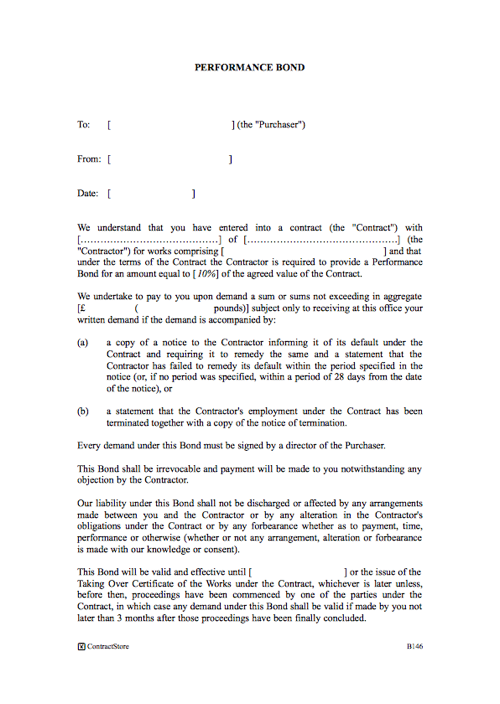 When referring to an event such as the issue of a certificate, the wording of the bond should reflect the wording of the contract to which it relates. .As will be seen, the validity period under our bond will automatically be extended if there are proceedings in progress. This allows the Purchaser to make a call if damages are awarded in the proceedings but the Contractor then fails to pay them. The final paragraph stipulates the governing law and the courts which have jurisdiction. A bond issued under English law is usually executed as a deed.